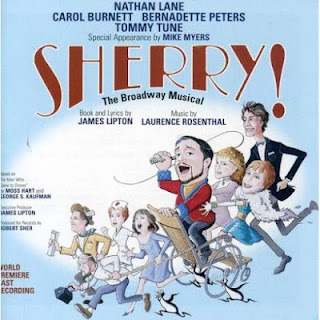 Jorge's Place: CD OF THE WEEK: SHERRY! CD OF THE WEEK: SHERRY! The first time I heard anything about this musical was when I bought the first CD of the “Unsung Musicals” series, where Christine Baranski and Jonathan Freeman delivered a fabulous rendition of the terrific title song. Since than that I’ve been waiting to hear the rest of the score, even do I doubted that there’s something as better as that fantastic title song. My prayers were answered in 2003, we this all star studio cast recording of that 1967 flopped musical. Like I thought, none of the other songs is a strong as the title number, but even so this is a pleasant score and there’s plenty of songs to enjoy. In fact this is a very tuneful score with beautiful ballads like “Maybe It’s Time for Me”, “With This Ring”, “Imagine That” and funny songs like “Putty in Your Hands”. The high profile cast make it sound like a truly original cast recording and the final result is a positive one. Anyway, I regret to inform that Nathan Lane and Carol Burnett’s rendition of “Sherry!” isn’t as strong and as funny as the one by Freeman and Baranski, although I know their names have more commercial potential. While I was playing the CD I start imagining that if it becomes a hit, maybe a Broadway revival may not be out of the question. I would cast Freeman as Sherry and Baranski as Lorraine Sheldon, with Karen Ziemba as Maggie Cutler (the Bernadette Peters role), Noah Racey as Beverly Carlton (the Tommy Tune role) and Brent Barrett as Bert Jefferson (the Tom Wopat role). But probably that will never happen, but no one can stop us of dreaming.